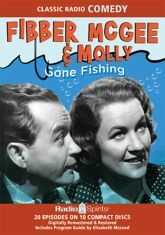 With a crash and and a thump and a tumble and a bang, open up the closet door for another hilarious visit with Fibber McGee and Molly! Head down to Wistful Vista with Jim and Marian Jordan for twenty zany radio comedy classics! Bill Thompson is heard as The Old Timer and Wallace Wimple, with Gale Gordon as Mayor LaTrivia and Foggy Williams, Arthur Q. Bryan as Doc Gamble, and Harlow Wilcox announcing in these entertaining episodes from 1948.